At approximately 3:30 p.m. on Sunday, a crowd of people in UCF’s Fairwinds Alumni ballroom watched as the last remaining lines of Hebrew script were inscribed into UCF Chabad’s very own Sefer Torah (Torah scroll). The finishing of this scroll marks not only the first Torah that this Chabad chapter has ever had, but also the first in the entire UCF community. Commissioned by Chabad students, alumni, faculty and families, the new Sefer Torah took over a year to complete. The writing of any Jewish Torah scroll is required to be handwritten by a specially trained scribe and absent of any mistakes. If an error is made at any point, the entire scroll becomes void and the scribe must start over from the beginning of the Torah. Thus, a great deal of time, energy and community support is necessary for the creation of any Sefer Torah. So it is no surprise that this joyously anticipated occasion was welcomed in with no less of a celebration than a Jewish wedding. In fact, the Torah’s finishing was compared to a wedding throughout the night, as it marks the creation of something loved, respected and shared by the entire community. The last lines of the torah were even inscribed under a chuppah, or a traditional Jewish canopy that a bride and groom say their vows underneath, bringing the wedding metaphor to life. Furthering the community’s involvement in the Torah, each member of the crowd was invited to participate in the final letters inscribed in the Torah by joining the scribe onstage to be a part of the process. In addition, every program book held a small piece of the new Torah’s mantle as it is customarily seen as a blessing of protection. Chabad’s Rabbi Chaim Lipskier and his wife Rivkie organized the funding for both the writing and celebration of the new Torah, which will be housed in their home, the Chabad house. Rabbi Lipskier, as well as other Rabbis and members of the Chabad and Jewish Studies faculty welcomed in the new Torah by addressing the crowd with words of wisdom. 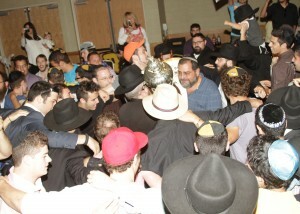 After the final lines of the Torah were completed, the real celebration began. The entire ballroom erupted in festivity. People sang and danced the traditional Hora while holding the newly finished Sefer Torah, giving everyone a chance to celebrate with it. The fervor and excitement was almost tangible as this pivotal moment marked the UCF Jewish community’s first ever very own Sefer Torah. To see more photos, click “Next Page” below.